On January 12th, 1922, two feet of fresh snow covered Brattleboro, Vermont (1). Thousands of people gathered on the town rink for the first annual Brattleboro Winter Carnival (2). A 25 piece band huddled around an oil heater to keep their instruments from freezing (1,2). Skaters had been brought up from Boston to kick off the carnival with their “fancy skating exhibition”, which The Brattleboro Daily Reformer (2) said left the crowd “unanimous in expressions of enjoyment and wonder”. The carnival also treated the crowd to local sportsmanship. The rival Springfield hockey team was invited to play a match versus the Brattleboro team, and a man referred to as “Hazelton” into a snowbank during a one mile ice skate race. As Hazelton disappeared into the snowbank, one of his competitors, Edwin Culver, sped away to take the win (3). Almost every event featured Fred H. Harris, a Brattleboro native, one of the carnival’s founders. Harris competed in skiing, snowshoeing, skating, ski jumping, ski joring and various other competitions. 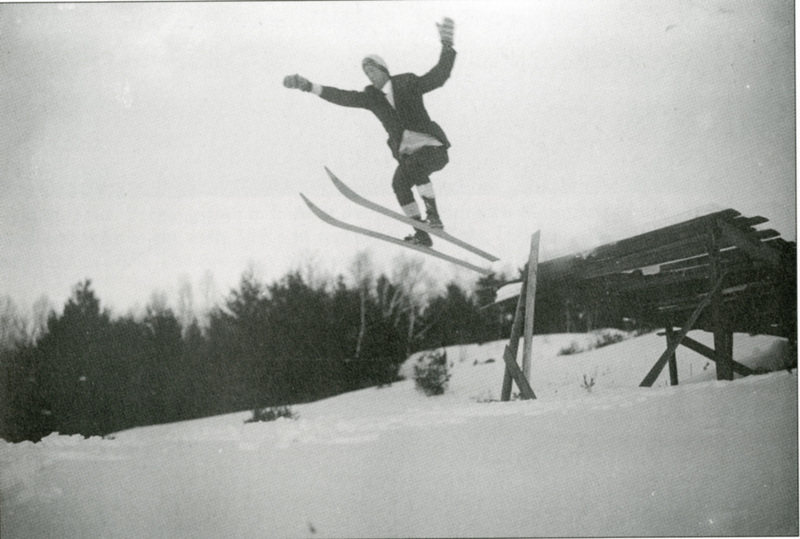 The founder of Harris Hill Ski Jump and the Dartmouth Outing Club (DOC), Harris was responsible for producing many future champions in various disciplines of skiing. But it was at his home carnival in Brattleboro where spectators witnessed him showing his true love and passion for outdoor sport and recreation. In 1888, when Fred Harris was born in Brattleboro, the Scandinavian tradition of skiing had yet to gain popularity in the Northeast (4). Upon arrival at Dartmouth in 1906, Harris wondered aloud, “what is there to do at Dartmouth in the winter?” (4,5). As a solution, he created the Dartmouth Outing Club, which led students on cross country ski and snowshoe trips through the New Hampshire hills and fostered interests in the different styles of skiing (4,5,6). There were very few skis available in the Northeast, and as Harris’s interest in the sport grew, he developed a method for manufacturing his own skis(4,7). He used 8-12 foot slabs of ash wood and made bindings out of leather (4,7). He began selling to friends and interested locals as skiing became less exotic (4,7). The next year Harris, with the help of the DOC, put on the first Dartmouth winter carnival (5,8). One of the first of its kind, it featured various ski and snowshoe competitions and became an iconic tradition in the Northeast (8). After college, Harris returned home to Brattleboro. His love for winter sports had grown and he had become one of the region’s best telemark skiers and ski jumpers (4). 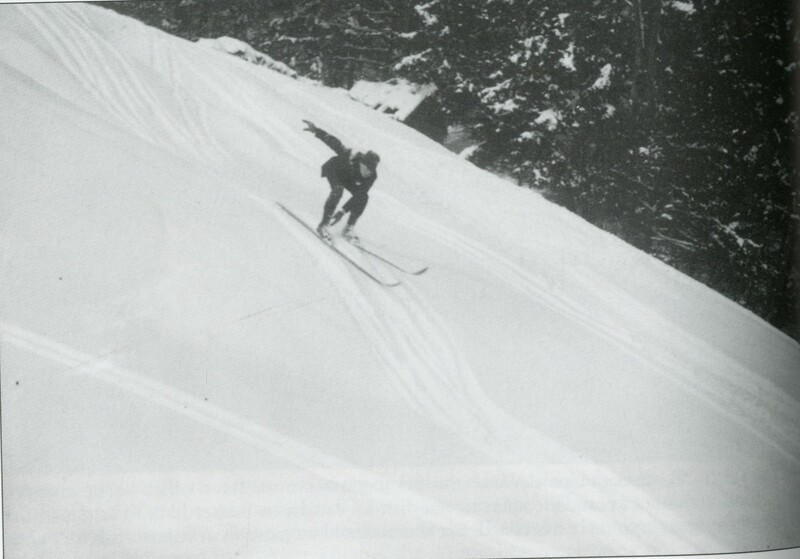 Skiing continued to increase in popularity, and Harris routinely published ski preparation and technique tutorials in the local newspaper (9). Harris was known in the area as an “extreme skier”. In 1909 he became the first man to ascend Mt. Washington on skis and ski down Tuckerman’s Ravine, an infamously steep section of mountain that was regarded as impossible to ski (6,10). 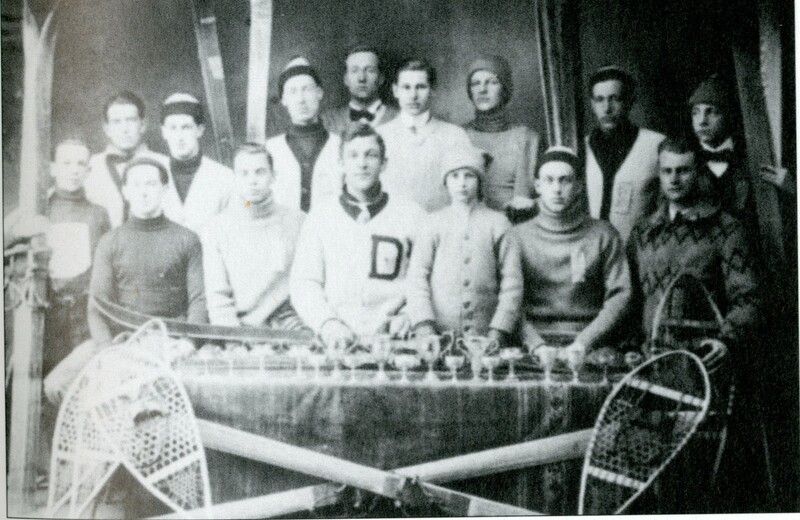 In late 1921, Harris and the Brattleboro Winter Sports Committee began making preparations for the town’s first winter carnival, modeled after Dartmouth’s (9,10). It was scheduled for January 12th and 13th (1). In the days leading up to the carnival, The Brattleboro Daily Reformer ran many stories previewing the events and Harris advertised hard to spark interest. The publicity paid off—dozens of people competed and thousands came to enjoy the fantastic weather and watch the competitions (2). People were pleased by the inclusiveness of the Carnival, especially in the showcasing of many of the town’s young athletes (12). Many local high schoolers with varying experience competed (12). One of the most popular events amongst the spectators was the race with the fewest contestants: skijoring (3). 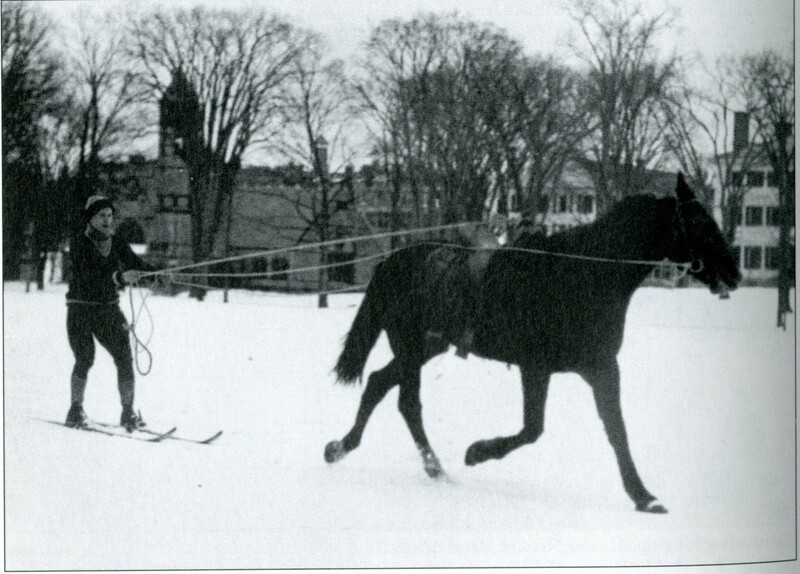 A skier held onto a long rope harnessed to a horse —“the difficult part consisting in the contestant maintaining his balance on skis while the horse was running”(3). Only Paul Estey and Brattleboro High School’s Phillip Wheeler dared racing Fred Harris, whose experience dated back to his time at Dartmouth (3,4). In the first two heats, Harris steadily pulled away from Wheeler and Estey, moving at a “considerable pace” down the town’s streets which had been scraped for the event(3). In the final heat, “Wheeler was given a handicap because of the superior speed of Harris’s horse”(3). Harris gained on Wheeler from the gun but the handicap was too great. Wheeler crossed the line first (3). The crowds were enthralled by the skijoring, and many were inspired to try it themselves (11). It was reported later that some Brattleboro men had even tried replacing the horse with a motorcycle, reaching speeds of 60 miles an hour(11). One of the most celebrated performances was Phillip Wheeler’s in the 2 mile cross country ski race (12). Squaring up against classmates and adults alike in front of hundreds of people, Wheeler led the pack through the hills and streets of Brattleboro. He crossed the line first in 27 minutes (12,13). Since he was running with 10 foot long skis in feet of fresh snow, it’s not surprising a similar event would be won in about a fourth the time today. 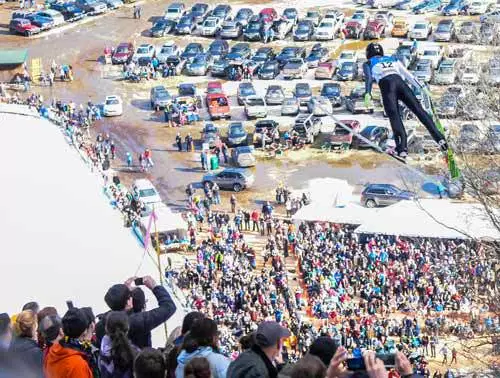 As one of the final events of the carnival, Harris led a crowd over to the ski hill where he demonstrated some of his favorite ski moves to the crowd, such as the telemark and christie turn (3). They also held a ski jumping competition using a makeshift jump (14). Most of the spectators had never imagined someone flying through the air on the skis that Harris and his cohorts used. The crowds were amazed, and for months afterwards, Brattleboro’s movie theater played footage of Harris and others soaring off the jump (14). Just as Harris had intended, many spectators became hooked on the sports that he’d introduced them to. Neighboring towns made plans for their own carnivals (12). Harris furthered people’s interests by leading ski expeditions into local mountains and creating the Brattleboro Outing Club (15,16). A month later, Harris had generated enough support to finish building a ski jumping hill in his hometown (10). Harris Hill became a major landmark for ski jumping in America. It has hosted the U.S. nationals many times, cementing Harris’ name in the legend books of nordic sport in the U.S. (17). Meanwhile, the Dartmouth Outing Club had begun producing many of the country’s best skiers. For decades, Dartmouth was the center of skiing in America, largely thanks to Harris (5). Harris is remembered by many for his creation of institutions where elite athletes flourished. But his work with winter carnivals was arguably more important because it was there that he made skiing popular among hundreds of people and planted the seeds for a vibrant ski community. “The Brattleboro Daily Reformer. (Brattleboro, Vt.) 1913-1955, January 12, 1922, EARLY MAIL EDITION, Page 1, Image 1.” Chronicling America RSS, Reformer, chroniclingamerica.loc.gov/lccn/sn86071593/1922-01-12/ed-1/seq-1/. “The Brattleboro Daily Reformer. (Brattleboro, Vt.) 1913-1955, January 13, 1922, EARLY MAIL EDITION, Page 1, Image 1.” Chronicling America RSS, Reformer, chroniclingamerica.loc.gov/lccn/sn86071593/1922-01-13/ed-1/seq-1/. “The Brattleboro Daily Reformer. (Brattleboro, Vt.) 1913-1955, January 13, 1922, EARLY MAIL EDITION, Page 4, Image 4.” Chronicling America RSS, Reformer, chroniclingamerica.loc.gov/lccn/sn86071593/1922-01-13/ed-1/seq-4/#date1=1900&index=0&rows=20&words=Fred+Harris&searchType=basic&sequence=0&state=Vermont&date2=1925&proxtext=fred+harris&y=0&x=0&dateFilterType=yearRange&page=1. Allen, E. John B. 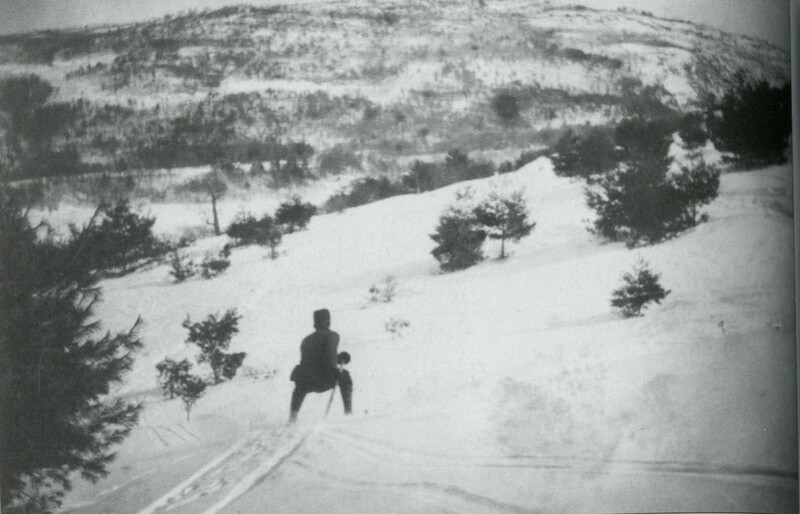 New England Skiing, 1870-1940. Arcadia, 1997. Lund, Morten. “In the Beginning, There Was Dartmouth.” Skiing Heritage Journal, books.google.com/books?id=-JLvKdmbA1AC&pg=PA8&lpg=PA8&dq=fred%2Bharris%2Bski&source=bl&ots=OQkylLsdNu&sig=pw3erjRsd653eSvBVWu6sYPVlRc&hl=en&sa=X&ved=0ahUKEwiPy8XavNrXAhUiTd8KHb5eCqk4ChDoAQg2MAM#v=onepage&q=fred%20harris%20ski&f=false. Allen, John. “From Skisport to Skiing.” From Skisport to Skiing, One Hundred Years of an American Sport, books.google.com/books?id=-n0Hz0uUy_AC&pg=PA197&lpg=PA197&dq=fred%2Bharris%2Bdartmouth&source=bl&ots=9VaNh_Gw-M&sig=nTz88yCZKFclu5y4EwRD2IwQim4&hl=en&sa=X&ved=0ahUKEwjYvP2rnYDYAhXD4CYKHVZSBMoQ6AEIVDAI#v=onepage&q=fred%20harris%20dartmouth&f=false. “The Early Days of Skiing,1934.” Vermont Historical Society, vermonthistory.org/research/research-resources-online/green-mountain-chronicles/the-early-days-of-skiing-1934. Esfahani-Smith, Emily. “Winter Carnival: Stories and Images.” The Dartmouth Review, www.dartreview.com/winter-carnival-stories-and-images/. “The Brattleboro Daily Reformer. (Brattleboro, Vt.) 1913-1955, December 27, 1921, EARLY MAIL EDITION, Page 3, Image 3.” Chronicling America RSS, Reformer, chroniclingamerica.loc.gov/lccn/sn86071593/1921-12-27/ed-1/seq-3/#date1=1900&index=2&rows=20&words=ski+skiing+Skiing+SKIING+skis&searchType=basic&sequence=0&state=Vermont&date2=1925&proxtext=ski&y=17&x=13&dateFilterType=yearRange&page=1. “About BOC Founder Fred Harris.” Brattleboro Outing Club, 16 Dec. 2010, brattleborooutingclub.org/history/fred-harris/. “The Brattleboro Daily Reformer. (Brattleboro, Vt.) 1913-1955, March 02, 1922, EARLY MAIL EDITION, Page 2, Image 2.” Chronicling America RSS, Reformer, chroniclingamerica.loc.gov/lccn/sn86071593/1922-03-02/ed-1/seq-2/#date1=1900&index=13&rows=20&words=joring+ski+ski-joring&searchType=basic&sequence=0&state=Vermont&date2=1925&proxtext=ski+joring&y=14&x=11&dateFilterType=yearRange&page=1. “The Brattleboro Daily Reformer. (Brattleboro, Vt.) 1913-1955, January 17, 1922, EARLY MAIL EDITION, Page 5, Image 5.” Chronicling America RSS, Reformer, chroniclingamerica.loc.gov/lccn/sn86071593/1922-01-17/ed-1/seq-5/#date1=1900&index=9&rows=20&words=joring+ski+ski-joring&searchType=basic&sequence=0&state=Vermont&date2=1925&proxtext=ski+joring&y=14&x=11&dateFilterType=yearRange&page=1. “The Brattleboro Daily Reformer. (Brattleboro, Vt.) 1913-1955, January 14, 1922, Page 8, Image 8.” Chronicling America RSS, Reformer, chroniclingamerica.loc.gov/lccn/sn86071593/1922-01-14/ed-1/seq-8/. “The Brattleboro Daily Reformer. (Brattleboro, Vt.) 1913-1955, March 06, 1922, EARLY MAIL EDITION, Page 8, Image 8.” Chronicling America RSS, Reformer, chroniclingamerica.loc.gov/lccn/sn86071593/1922-03-06/ed-1/seq-8/#date1=1900&index=16&rows=20&words=CARNIVAL+Carnival&searchType=basic&sequence=0&state=Vermont&date2=1925&proxtext=carnival&y=0&x=0&dateFilterType=yearRange&page=1. “The Brattleboro Daily Reformer. (Brattleboro, Vt.) 1913-1955, January 24, 1922, EARLY MAIL EDITION, Page 1, Image 1.” News about Chronicling America RSS, Reformer, chroniclingamerica.loc.gov/lccn/sn86071593/1922-01-24/ed-1/seq-1/#date1=1900&index=19&rows=20&words=SKI+ski+skied+skiing+sKiing+skis&searchType=basic&sequence=0&state=Vermont&date2=1925&proxtext=skiing&y=0&x=0&dateFilterType=yearRange&page=1. “The Brattleboro Daily Reformer. (Brattleboro, Vt.) 1913-1955, January 10, 1922, EARLY MAIL EDITION, Page 5, Image 5.” Chronicling America RSS, Reformer, chroniclingamerica.loc.gov/lccn/sn86071593/1922-01-10/ed-1/seq-5/#date1=1921&index=11&rows=20&words=Harris+HARRIS+Harry&searchType=basic&sequence=0&state=Vermont&date2=1923&proxtext=harris&y=15&x=17&dateFilterType=yearRange&page=1. “Fred Harris.” Vermont Sports Hall of Fame > Fred Harris, www.vermontsportshall.com/harris2015.html.